Alternate Data Streams (ADS) allow arbitrary metadata to be associated with files and directories on Windows NTFS. Alternate data streams are the Windows implementation of forks. The apparent size of the file will be unchanged, and most applications and users are unaware of their existence. If a file is moved, any alternate data stream will move along with it, as long as the destination is on an NTFS drive. The command line can access alternate data streams using redirection operators. Streams are specified on the command line as filename:stream name. 06/25/2010  11:27 PM    <DIR>          . 06/25/2010  11:27 PM    <DIR>          .. Stream names are generally held to the same requirements as any filename. One interesting difference is that stream names can contain characters whose integer representations are in the range from 1 through 31. Refer to Naming Files, Paths, and Namespaces (MSDN) for details. Note that when using streams with files having a single letter name, the filename should be prefixed with a period and backslash. The reason for this is Windows drive names. For example, does "echo hello > c:test" refer to a stream named test on file c, or does it refer to a file test on drive c? As of Windows Vista, it is no longer possible to execute directly from an alternate data stream. 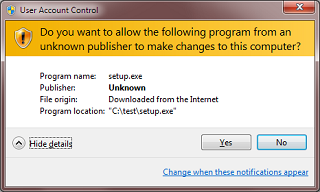 On Windows XP and earlier, the Start command was used, similar to start somefile.ext:hiddenExecutable. Notepad can be used to create and edit alternate data streams. The File Open dialog doesn't recognize stream syntax, however, so the file must be created and opened using command line parameters. Notepad will insist on appending .txt to the stream name. Microsoft provides a sample program in C++, demonstrating how to open and write to an alternate data stream. The PowerShell blog has more information on zone identifiers. The W2K.Stream virus used alternate data streams. This entry was posted in C++, Scripting, Technology, Windows. Bookmark the permalink. wow, this information its very hopefull, now i can understand how is working this part of the stream on the operating systems and i don´t knowed. And the examples are very clearly. thanks for this information.